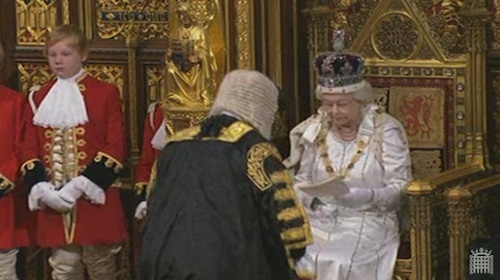 The Queen has detailed the government's upcoming programme of law-making on a grey day darkened by the gloom of a double-dip recession and plans to massively increase surveillance of the internet in the UK. Opening the new session of Parliament, Her Majesty confirmed on Wednesday that "draft clauses" would be introduced to allow MPs to scrutinise Home Secretary Theresa May's Communications Capabilities Development Programme (CCDP) - the controversial project to allow security services in Blighty to monitor the population online. It's unclear if those "strict safeguards" mean that a warrant, for example, would be needed before spooks could access such data. The rough proposal appeared to only fuzzily indicate that such protection for British citizens would be provided, however. A Home Office document about the proposed draft bill [PDF] stated that an updated framework to aid the "lawful, efficient and effective obtaining of communications data by authorised public authorities including law enforcement and intelligence agencies" would be established. It added that safeguards such as imposing a 12-month limit on the length of time such private data could be retained by communication service providers would be proposed. The Information Commissioner Christopher Graham will be tasked with reviewing such data retention plans. "The ability of the police and intelligence agencies to continue to access communications data which is vital in supporting their work in protecting the public." "An updated framework for the collection, retention and acquisition of communications data which enables a flexible response to technological change." The proposed bill described communications data as being "information about a communication, not the communication itself". May and her department have tried to bat aside criticism from civil liberties groups by saying that "no emails would be read in real-time". But many have complained that the cabinet minister's reassurances are unfounded given that the net-snooping plan would involve GCHQ operatives monitoring everything an individual does online, if not snoop on the content of messages. The time and duration of communications would be probed, as would telephone numbers or email addresses that have been contacted, and "sometimes the location of the originator of the communication". But beyond that, very little technical detail was offered in the draft communications data bill this morning. The CCDP was originally expected to be included in the crime and courts or justice and security bills - the fact it is now standalone and in draft form will subject it to greater parliamentary scrutiny.